FREE UK DELIVERY + £10 OFF YOUR 1ST ORDER. Enter code NCD10 at checkout & click recalculate. 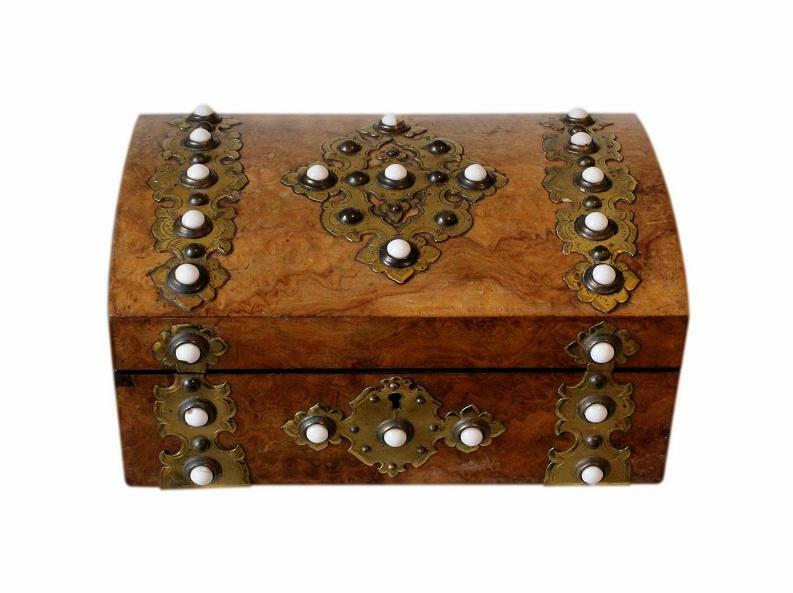 This is a beautiful antique jewellery box, dating to 1870/1880. This box has a fabulous Walnut veneer which has beautiful colour and figuration. 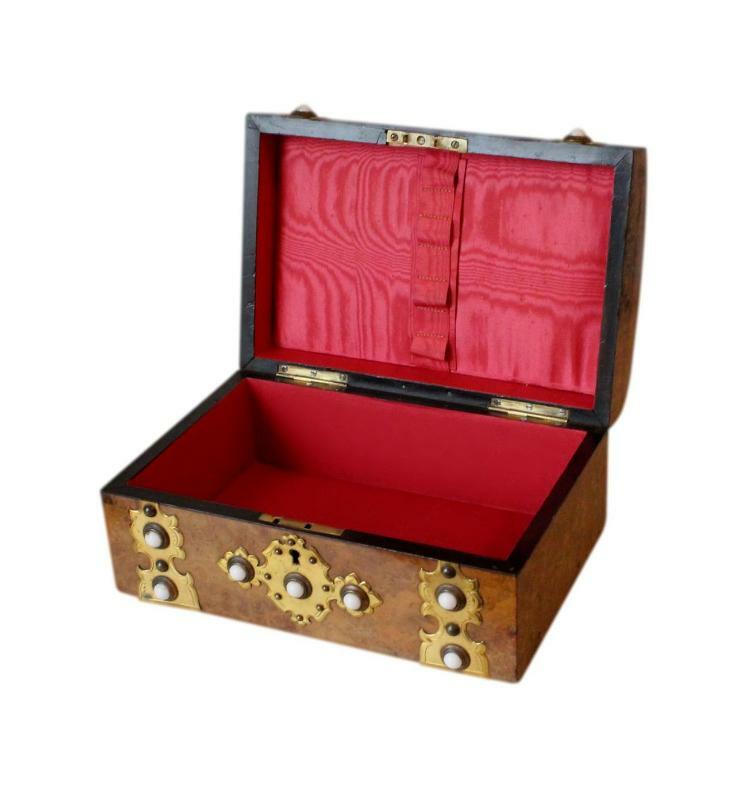 There is fantastic ornate brass decoration to the lid and front of the box, with beautiful bezel set glass cabochons upon the brass. The box is complete with its original brass hinges, lock and key. 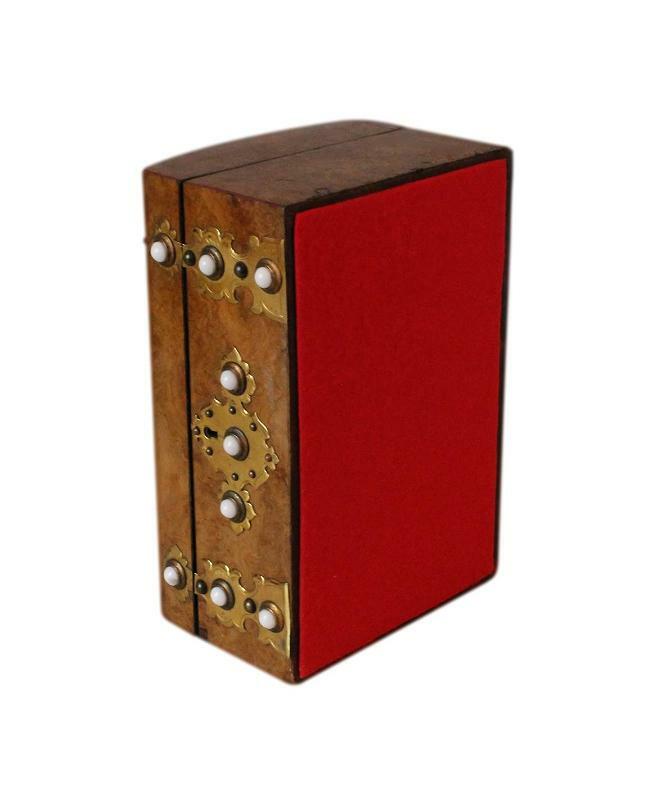 The bottom of the box has a new red felt covering which will protect the surfaces of furniture. The interior has a single large storage compartment which is deep and spacious. This has been refurbished by our skilled box restorer. It has a beautiful new padded satin panel in the base and new quality paper linings. The inside of the lid has its original padded panel which is covered with quality watered silk. The panel has a watered silk strip down the centre and small photos or notes can be tucked behind this. It also has loops which you can insert brooches into. There are new paper linings to the walls inside the lid. 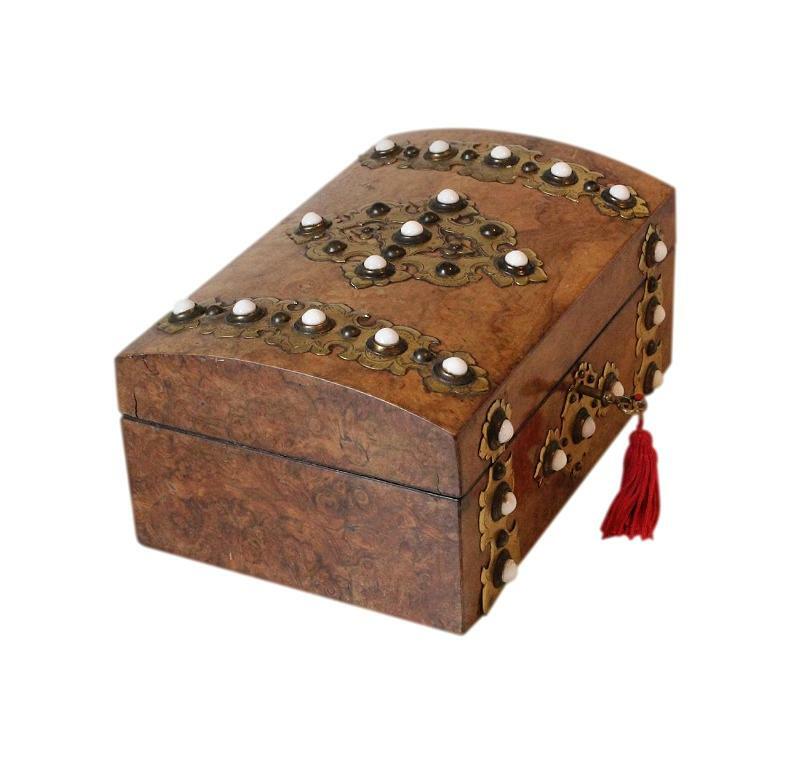 The box will tip back when the lid is opened UNTIL the compartment has jewellery inside it. This is due to the weight of the brass decoration. 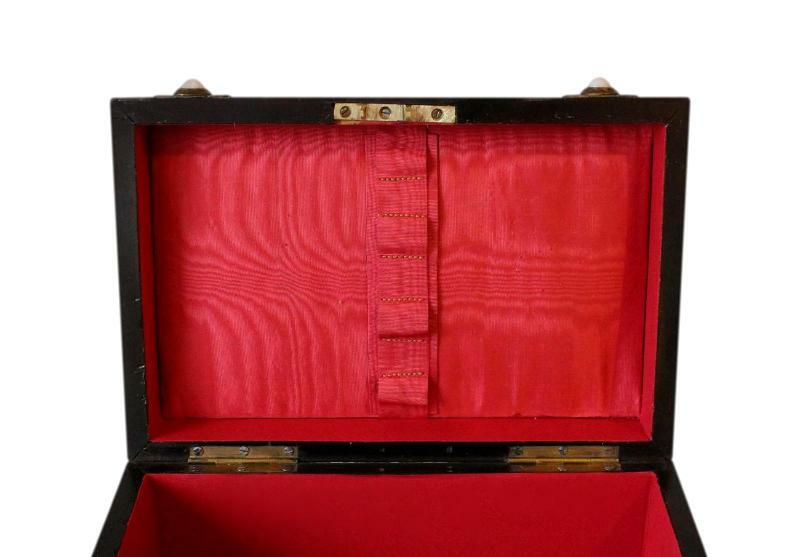 You can read about Jim, our wonderful box restorer, by visiting our About Us page. 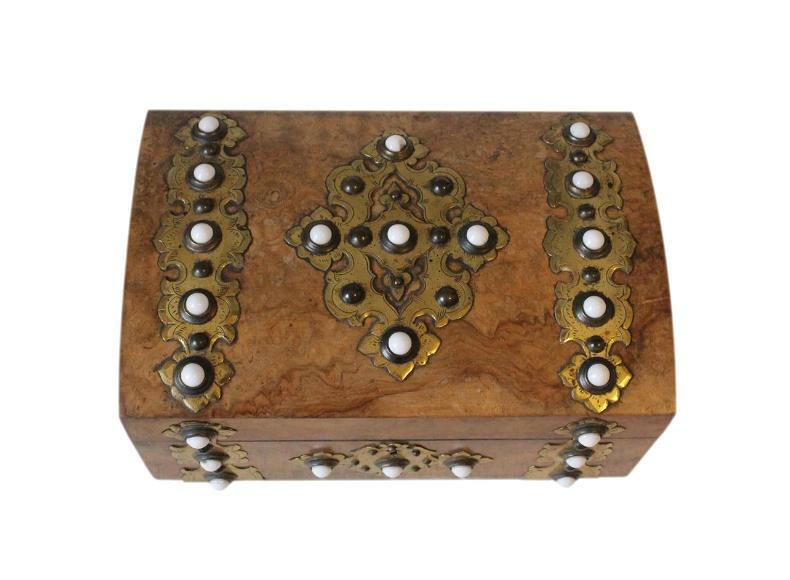 This fabulous box is in excellent condition for its 130/140 years of age. It is structurally sound and has no loss of veneer. There is some minor age related wear to the Walnut. There are a few cabochons which have small chips. These are not overly noticeable or rough. The hinges and lock are still in good working order and the box locks securely. The original satin to the inside of the lid is still lovely and has no stains. It has some tiny minor pulls. The new satin panel and paper linings are in excellent condition, being new. 20.5 by 12.8cm with a 5.9cm depth. International postage is £25. Delivery is fast, within 3-5 working days to Europe and 5-7 working days to the rest of the world. Postage is by Royal Mail International Tracked and/or Signed For postage.